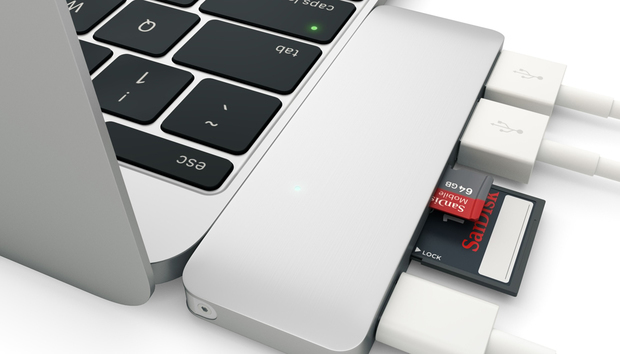 MacBook docks have started to arrive a year after Apple introduced its single-port USB-C–based ultra-portable MacBook, and the Satechi Type-C Pass Through USB Hub with USB-C Charging Port is one that will fit a lot of users’ needs at an affordable price. Of special interest is its inclusion of USB-C pass-through power, something that’s popping up all over suddenly, letting you continue to keep a MacBook charged while using external ports. The dock is tiny and handsome in brushed aluminum available in colors matching Apple’s three MacBook options, gold, silver and space gray. For Mac users, the Satechi logo and branding on the top may be too much, but you’re in luck! 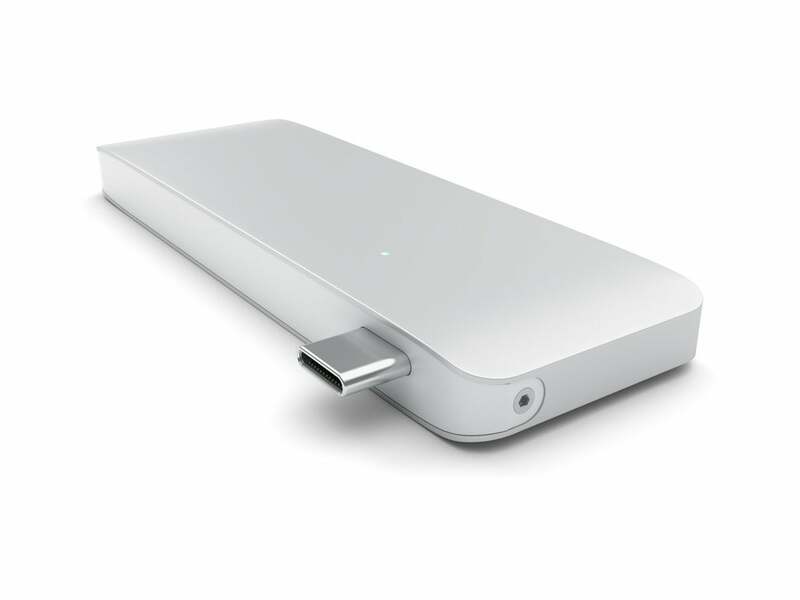 Because USB-C is reversible, you can use the dock, which has an integral connector, either sticking out past the back of the Mac (showing the branding) or tucked in towards the trackpad end, unadorned. The USB-C connection can’t be used for data, only for power. 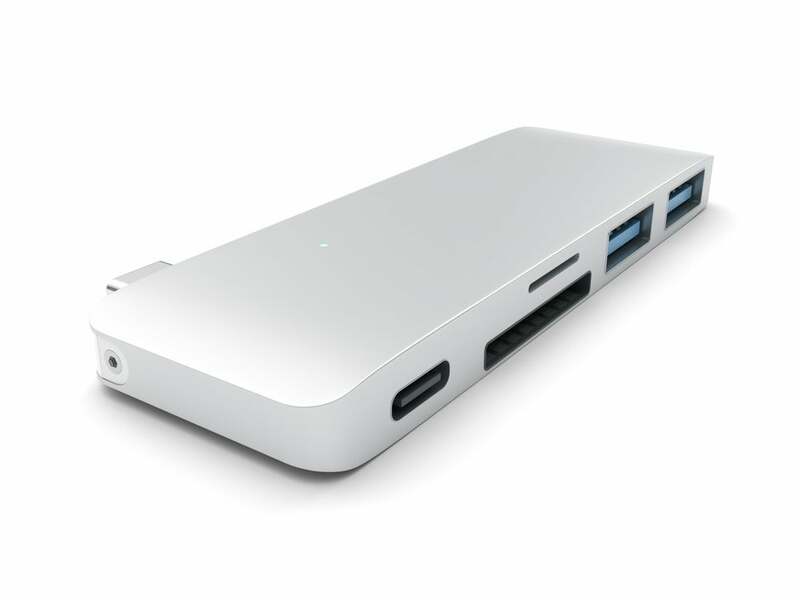 The dock has four ports in addition to the USB-C pass-through: two USB 3.0 Type-A jacks, one full-sized SD card slot, and a microSD slot. In a previous model of the Satechi dock that lacks the power pass-through, the memory card slots couldn’t be used simultaneously. While Satechi says that’s the case with this dock as well, I was able to mount both card types and copy between them. The microSD slot is awkward though that’s true of all similar slots. The card has to be inserted flipped (logo on bottom) when the dock’s logo is facing up. I inserted it the wrong way around and had to use a pair of pliers to remove it very carefully. I’d recommend using an SD card adapter (which ships with most microSD cards) unless you can train yourself. The SD slot is also slightly awkward: You only need to push the card in a very small amount, just enough to cover the exposed pins. Weighing in at 0.64 ounces and measuring 3.31 by 1.06 by 0.3 inches (plus a projecting USB-C jack), and costing just $45, the dock is a perfect lightweight counterpart to the MacBook that replaces two to four other adapters and devices, most of which won’t pass USB-C power.